WASHINGTON — U.S. Sen. Tim Scott, R-S.C., honored Martin Luther King Jr. with Vice President-elect Mike Pence on Monday, the federal holiday to commemorate the civil rights leader's life and work. Scott, the Senate's only black Republican, joined Pence and his wife in laying a wreath at the King memorial on the National Mall in Washington, D.C. 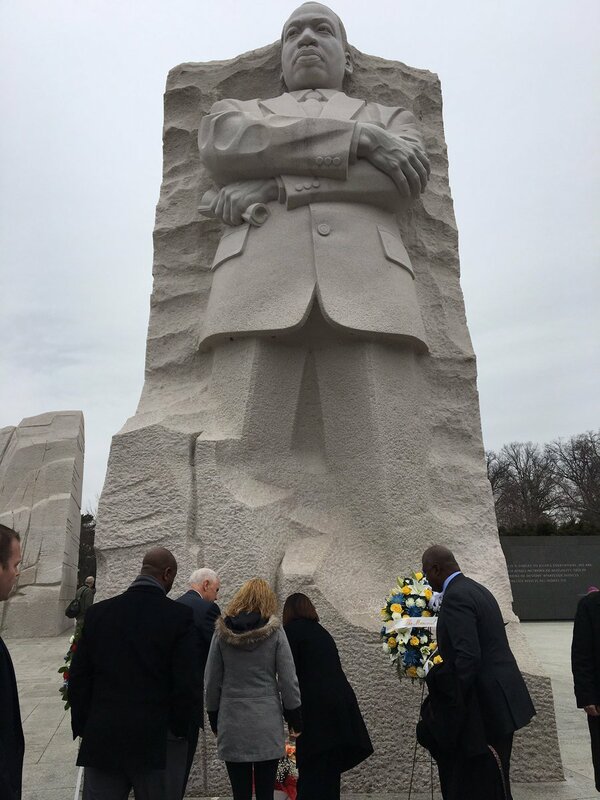 They were joined by Harry Johnson, president of the Martin Luther King Memorial Project Foundation. Sean Smith, a spokesman for Scott, told The Post and Courier that the senator had planned to be in the nation's capitol on Monday anyway to participate in a local nonprofit's day of service for the city's homeless. The idea to visit the King memorial with Pence, who has been living in Washington since the election, came out of conversations between the two men's staffs, said Smith. Scott has established a good relationship with Pence, who invited the lawmaker for a one-on-one meeting in New York late last year and might have been the one to facilitate Scott's appointment to President-elect Donald Trump's transition team. Scott has also said that he and Pence talk on the phone and text. The joint visit to the King memorial on Monday comes two days after Trump criticized civil rights icon and U.S. Rep. John Lewis, D-Ga., on Twitter for questioning the legitimacy of Trump's presidency given Russian interference in the election. Trump also reportedly canceled a planned visit on Monday to the National Museum of African American History of History and Culture because of "scheduling issues," instead meeting with King's son, Martin Luther King III, in New York City. Scott went on Fox News on Sunday morning to weigh in on the controversy, voicing support for Lewis as an "American hero," and Trump as "the legitimate president." He also called for both sides to stop engaging in a game of "verbal Russian roulette." Scott's excursion with Pence on Monday is an extension of his efforts to put a kinder, gentler face on the majority-white Republican Party accused of racial insensitivity from Trump's comments to GOP support for U.S. Attorney General nominee Jeff Sessions. The U.S. Republican Senator from Alabama's racially tinged remarks in the 1980s derailed his confirmation for a federal judgeship. Scott, after inviting Sessions to Charleston to meet with community leaders and black clergy, announced last week he would support him for attorney general.